BBC NEWS | Have Your Say | How can Britain's language skills be improved? How can Britain's language skills be improved? Poor language skills are affecting Britain's business performance, according to a House of Lords report. The House of Lords European Union Committee has also criticised the government's decision to make languages optional at GCSE in England. The peers warned that poor language skills "will severely hamper the country's ability to protect and promote our interests abroad and to compete successfully". However, the government has said that by 2010, every child aged seven to 11 should be able to learn a language. What steps should be taken to improve the UK's language skills? What do you think of language teaching in schools? Do you agree that poor language skills are affecting British businesses? I don't believe that the English-speaking world is the only area that is full of monolingual people. I had to speak fluent Spanish to get by in Colombia, as the Latin Americans know that all but 4 Latin American nations are Spanish speaking, whereas people in East Asia are more inclined to learn English, as it is the only lingua franca there. To argue that students shouldn't learn other languages until they improve their own "wretched" English first is to get the argument entirely backward - the best way to improve English at home is to encourage foreign language study. That way, by grappling with the unique subtleties of communicating in another language, they can find a deeper appreciation for their mother tongue. Is it any wonder that people who study foreign languages tend to be more articulate in their own? This is the price you pay for success and arrogance. It is even worse in my country. People feel that others are obligated to speak English wherever they are. I have even heard people to demand others speak 'American'. Sometimes I really hate this country. I teach English as a second language at a South Korean secondary school. Learning English is a very high student priority here. But there is a growing feeling amongst young Koreans of "why should I?". In the not too distant future English could easily be removed from being the international language if people start insisting that there should be an equal compromise in language usage. Therefore it's very important for British students to learn other languages too. I am a language teacher in a secondary school. How on earth can a government emphasise the importance of languages by introducing them in primary schools but making them optional at GCSE? Making it an entitlement rather than an obligation for older students makes a second foreign language a ready target if a school needs to cut back. Come on see sense you politicos! Learning language correctly requires much more reading and writing than the general young public does now in era of mobile phones and computers. Only a kind of slogan language and abbreviated engineering language is used. That produces terribly poor "lingo". More manual writing, more obligatory book reading, more computer free interactive lessons and studies will help to recover the lost language skills. Mind you, still not all will loose the skills, only about 98% will become language idiots. The Britons aged over 40 generally speak and write very good English. You have to start at an early age. Secondary school is much too late. 38 years ago the headmaster in my Scottish primary school gave me and 4 other girls French lessons each day for 30 mins. It was his own personal experiment and we all loved it and went on to become fluent in the language. You have to start at an early age. Secondary school is much too late. I've lived in England all my life and I don't intend to ever live anywhere else. My job (Like the vast majority of people's) doesn't require any foreign language skills whatsoever and I don't remember a time where this sort of knowledge would have been useful. Learning a foreign language would just be a waste of my time. This begs the question of whether we need to learn foreign languages. Speaking English is essential for people in mainland Europe, due to the prevalence of English as the de facto international language. European countries receive cultural influence from English-speaking countries, therefore there is a direct benefit to learning them, as it allows them to understand English-speaking TV/music/films. However there is no direct benefit for most English-speakers learning another language. I for one did GCSE Spanish, but have never used it and can barely remember any of it. Most people in the UK will never use a language even if they learn it, so why bother? Countries speaking different languages is an obsolete concept. Eventually most languages will die out. The remaining two will probably be English and Chinese. It seems to me that the best and easiest way to learn another language is when children are less than 7 years old. Why are there not more language immersion classes in British Primary Schools or bilingual pre-schools? Our local equivalent of a primary school in Berkeley has a bilingual program with the aim of all pupils speaking and writing in Spanish by the time they leave. I have hired a Spanish-speaking "nanny" to care for my son 3 days a week because I want him to learn another language while its easy. He already understands her when she speaks Spanish and speaks a few Spanish words already (and lots of English words) at the age of 1.5 yrs. Learning a foreign language does wonders to improve your native tongue. You get a totally new perspective on the workings of your own language, especially grammar. The lack of German speakers in the UK meant that I could get into jobs I would have otherwise not been considered for. It certainly did the trick for me. I agree that a foreign language is best learnt in its native country. Language and culture go together. It's great fun too. Learning foreign language(s) is all very well, but I would like to see a greater emphasis put on children learning English properly first. Children ought to be taught how to express themselves properly in English before any attempt is made to teach a foreign language - how about foreign languages only being taught to those whose understanding of English (i.e. spelling, grammar, reading ability) was of a superior level? I have been quite shocked to find that many Americans have better languages skills than we do. Something must be done or we'll be the laughing stock of Europe. I studied French and Spanish to GCSE level and found that a lot of students had trouble using the correct form of a verb as they had such poor knowledge of basic grammar. Teaching grammar to primary school children may be very tedious and difficult for them to grasp, but trying to teach languages to children who do not know what a tense, verb or pronoun is a more difficult task. I've been learning to speak Portuguese for over two years now (admittedly, because I'll be moving abroad). What I have discovered is that learning a European language has actually improved my understanding of English. Even if one never uses the foreign language skills one learns, surely this is a good enough reason alone to increase the teaching of foreign languages. The standards of our own English language have been waning for a very long time now. More foreign languages skills at school, please! Much of the "poor language skills" that I meet are from immigrants who have little need to learn English when everything, especially the benefits system is in their own language. English lessons should be compulsory and the only documents translated into foreign languages should be those explaining their responsibilities in matters such as paying tax. That's my suggestion for the improvement necessary. There is no point in learning languages as English is the world's language. I have a degree in French and speak the language fluently. It has not benefited me one bit! Here in Wales we waste educational resources forcing children to learn a useless language that should have died years ago (Welsh) purely for political and historical rather than practical reasons. In 50 years time the only languages of consequence in the world will be English, Spanish, Chinese, Arabic and maybe one or two others. We should concentrate our efforts on those languages (especially Chinese) if we want to prosper. Since practically every political party in the UK has pledged to pour money into education, some of this money should go towards hiring language teachers for primary schools. If we teach children foreign languages at an early age, perhaps within a generation the UK will no longer be an international disgrace. Our attitudes towards foreign cultures play a significant role in our willingness to learn their languages. If the British as a nation do not have sufficient appreciation of other cultures, it would be unrealistic to expect that people are good at learning foreign languages. I speak fluent German and good Spanish. I am sick to death of all of these articles that tell me UK companies are desperate for foreign language speakers. I have also read that those who speak a foreign language can expect a salary of £3,000 more per year. Well, where are these companies? I'm looking for a job and I can't find hardly any jobs. The few that I can find are offering an average wage at best. There's no point teaching foreign languages if the jobs are not there. Language acquisition tends to happen when a child is very young. There is no reason not to expose children to other languages as they start at a nursery or playgroup. It need not be formal; songs, cartoons and basic vocabulary are all you need at that age. Formal language lessons, in two languages, should be compulsory from year 1 of primary school. I am not sure about making it compulsory at GCSE, but certainly to age 14 after which they can chose their GCSE subjects. Shut down television so people turn round and talk to each other. In countries like China and Thailand, it is compulsory for children to learn English. Learning a foreign language should no longer be mandatory in our schools; and the government should not print forms in any language other than English. Let's be honest, the fact that most popular TV shows are in English helps foreign people learn the language (the American version mostly at that). I think we should concentrate on the lax attitude to learning in general in this country before worrying about specific subjects. As an American I can relate to Britain's lack of language skills. The US has one of the most diverse (if not the most diverse) populations on the face of the planet. However, I do not know too many people that are bilingual or know several languages. I, for one, am learning Spanish at the present time with the help of my sister and another friend who are both fluent. It is an increasingly necessary skill for the workforce today, even in Pittsburgh. Languages should be taught in the same way that we learn to speak as children. No books until we have a rudimentary grasp of the spoken word - then we can start reading and writing. UK schools are geared up to teach languages in the reverse order and so it is no wonder that children get discouraged. As a member of the governing body of a primary school, I am pleased that we are trying to find the opportunity to introduce French lessons. However, they will have to be extra-curricular, and the children will in all probability need to cover the same ground when they reach secondary school, as there is no system in place to deal with children arriving with some experience. This seems a shame, but it reflects the general attitude that, as English speakers, we have no need to speak anything else. Those contributing such views to these pages would probably be among the first to complain if they came across a foreigner who was unable to speak much English. It is also clear from the standard of some submissions on this page that English grammar could do with a bit more emphasis in schools as well! The problem is that languages are taught in such a back to front way. I hated learning languages at school because I seemed to spend more time being corrected on my written syntax and spelling than I did learning to speak French. Surely the focus should be on speaking and listening skills, rather than writing. We don't teach children English this way around, and most people would benefit more from being able to speak conversationally, than write an essay. Look at how well America is doing! There is little emphasis placed on learning foreign languages in school, so when most Americans travel to a place with a different language, they just talk louder and slower to be understood. I cannot count the number of times I have had to play the part of the translator. They expect everyone around to speak English to them, and when it does not happen they become mad and frustrated. Please Britain, don't turn into us! From what I have seen from young people's oral and written skills in this country, teaching them to speak English would be a pretty good start. If we are so short of workers in the UK that we have to recruit large numbers of workers from abroad, is it sensible to encourage potential workers to learn other languages when this may mean that they are more likely to work abroad instead of at home? I thought everything in the EU was on the road to being standardised? There is a single currency, the metric system, common laws, etc, and yet the most fundamental part of everyday life - communication - is not yet standardised. If the EU ever wants to compete on a business level with the USA then a single language needs to be adopted. Do the Australian thing and have nursery teachers speaking different languages to kindergarten kids i.e. start them young. Language teaching in schools is dependent upon the availability of teachers. There isn't enough. Are there any good language teachers in the new arrivals to this country that we are not using? Of course it will affect business, particularly in the developing markets. I spent seven years attempting to learn French (we did do it at primary school). Since then I have been to France once for two days, I am now 42. Add up all the man-hours of wasted teaching when multiplied by the number of people in this position. An absolute waste of time as far as I'm concerned. Northern Ireland has Irish and Ulster Scots, Wales has Welsh and Scotland two Celtic languages of its own. Cornwall used to have Cornish until relatively recently. But all these languages were squeezed out of use by English. It's no wonder the general cultural attitude is that learning a second language is a waste of time. As an American I'm quite impressed at how the English speak English. Despite using some words with different meanings than we do and using some words, like "whilst" that we don't use at all, the clarity and well-organized way you convey messages is impressive. You certainly have a knack for concise yet convincing ways of explaining things, which, I suspect, contributes to your success in world politics. My own writing style has improved since becoming a regular reader of the BBC website. And I ain't lyin'. Maybe schools ought to teach French properly then instead of just coaching kids for the exam. Compulsory language lessons for Primary Schools might also help, and they should teach a variety, too - not just French, but other major languages too like Spanish, Arabic and Mandarin Chinese. Children nowadays don't even have a basic grasp of English, never mind other languages. Los Angeles is a mix of cultures, but the one language that binds us together is English. In business and dealing with the rest of the world English should be taught. I the realm of being sensitive to other cultures English skill seems to be very lacking. I think the French education system have got it right. We should teach foreign languages from the first year of school until year 10. Children's brains are much better at assimilating and differentiating between methods of communication at a young age. The option at GCSE, should be whether to drop the language, not to take it at a level when our brains are starting to level out. If by 2010 every child aged seven to 11 is able to learn a language, then we might possibly have a solution in fifteen years time. The government's plans don't seem to be keeping up with the rate of European integration. I think there are two main problems here. The first is the UK lazy attitude to "Well they can speak English so why bother". Secondly, insufficient grammar being taught at school. I work full time in Germany and have struggled to get up to speed with their language because of my lack of knowledge of English grammar. There is however a certain degree of satisfaction being able to converse with people in their own language. I can speak five languages: English, Gujarat, Hungarian, Welsh and an ancient form of Persian. I am particularly good at language skills and can pick up a new language relatively easy. Not everyone is as good as me though and have difficulty learning languages, they may excel in other skills where I am poor; such as car mechanics. I don't think we should expect people to learn another language if they don't want to. The report misses the point. It's the British ignorance of foreign cultures rather than poor language skills that affects British business. Our company recently severed links with a UK-based partner owing to its employees' sense of superiority. We now work with partners in Germany. At least they have an intercultural awareness even if we do have to communicate in English. Opt for a baccalaureate system, so languages are studied until 18. Then make it compulsory to study at least one foreign language throughout higher education. Language skills make our kids less narrow-minded. Conversely, living in a country full of monolinguists means trilinguists like me get the better jobs! Schools should teach subjects such as history and geography in French. So even though most of the subject matter in them is instantly forgettable, you still get something out of them. The attitude of the British towards learning a foreign language needs desperate improvement. Here in Paderborn we have a considerable number of British people mostly related to the Army (but not all), and I have only met two other Brits in my time living here (over two years) who could speak German. To make this problem worse, some of these people complain when they go to a shop or bar and the staff can't speak English. As a result, the British community here, independent of the Army, have created their own little parallel community, with their own TV stations, radio stations, shops and such like, yet little criticism is heaped on these people in the same way that the Federal Government criticises the Turkish or Russian communities for not "blending in". Hey, Americans are notoriously bad at foreign language learning - and our international business performance is doing just fine. Make language learning available, the market will provide sufficient incentive. As someone that studied both French and German A-level, I can honestly say I enjoyed them, even though I've only used them once in the last twenty years. As someone who is about to complete training as a primary school teacher, I wonder what I should take out of the week's timetable to make room for a foreign language. Perhaps the children could miss playtime or lunchtime? Should they come into school on Saturdays? Or perhaps I should just send the stuff as homework so that parents can do it with them at home and learn at the same time? The decline of language learning is, in my view, largely attributable to modern society's obsession with the practical (usually financial) rewards attached to learning in general. I speak three European languages fluently and the experience which my knowledge has brought me has enriched my life beyond belief. It is impossible to gain any real insight into life in a foreign country without knowledge of the local language. Without ever having any opportunity to gain insight into the cultural life of other countries, we are doomed to remain, as so many British people sadly are, culturally ignorant and narrow-minded. Some have responded by saying English is the predominant language of trade which, at present at least, is probably true. However you're a fool if you think this will always be the case. I assume we want to remain competitive on a global level both in Europe (especially the new Slavic EU nations) and with future market leaders such as India and China. Expecting future trading partners in these areas to wish to converse in English put our prosperity in severe jeopardy. Last year I was in Kiev with Germans (from both West and East), Ukrainians and French. The language we had in common was, of course, English. The only place I have had difficulty getting by with just English, a little French and a minute amount of German is Madrid. It's a misconception that learning a foreign language somehow distracts children from mastering their own language. On the contrary, learning the grammar and vocabulary of other languages enhances understanding of how one's own language works. We should speak another language, it's so embarrassing to go abroad and hear the British shouting loudly and slowly in English... I always pretend I can't speak English, so much easier. Whilst I think learning other foreign languages is a good idea, I do think that we should be teaching BSL (British Sign Language) as well. My brother's school had both a visual resource unit and a deaf resource unit. 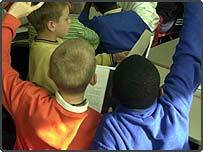 All children are expected to sign to songs in assembly and to the other deaf children. They also pick up on sight-reading Braille, as well as the deaf children communicating with the blind children. It frightens me that children are being pushed into learning foreign languages before learning how to do basic communication with their peers. I'm not suggesting that learning French or German be scrapped, it's just whilst we are teaching our children to learn holiday languages we are alienating those who use BSL all of the time. Poor language skills are not a unique problem for Britain. Throughout the English speaking world there is a lack of second language ability among citizens. What is not recognised by foreigners is the relative ease for a Dutchman to learn English compared to a Briton learning Dutch. This is because it is almost impossible to avoid some contact with the English language in most countries, whereas the British don't have that luxury to anywhere near the same degree. I have lived in the Arabian Gulf for nearly 15 years and have learnt little Arabic beyond basic courtesies. I tried in the beginning, but everyone else (of many nationalities) speaks good English, I no longer need to learn Arabic. Shame on me definitely, but it's still a fact of life out here. It's the same for so many countries who all seem to learn English so we no longer feel the need to learn their languages. My language learning time at school was a waste of time (French, German and Spanish). Start teaching children as soon as they start school, not when they're 11+, that's too late. But I agree that we need to teach out kids how to speak, read and write English first. English is a tremendous advantage for the UK and explains the success of its economy today in a globalised world. The UK speaks the global language, and therefore swims in globalization. Other countries need to make an effort to access it. The company I work for has recently started to take on a large amount of European business including several accounts in Germany. I made an offer to my boss saying I was prepared to go to night school to brush up on the basic German I learnt quite a few years ago if they would assist me financially - they simply don't pay enough for me to afford it all by myself. When he had finished laughing - a good few minutes later - I got the idea that he was not prepared to take my suggestion any further. There are no German speaking members of staff within our company. If this is the sort of attitude British companies wish to take then they do not deserve to be successful outside of the British Isles. Friends of mine have moved to Belgium where their five year old is already learning English and German in a French speaking school. My six year old has no state access to languages until they're 11 and even then, it's only one language. I think languages should be taught in primary schools, as kids of that age are extremely receptive and eager to learn. Children seem to have fewer inhibitions as youngsters - it's only when they reach their teens that they show signs of embarrassment and of not wanting to take part and learn! There would be so many more avenues open to our kids if they were fluent in other languages. This is going to rile a few people, but English is the world language and more people than not can speak it. So no, we shouldn't have to waste time learning other languages. If French, Somali or Urdu were the world languages, then we'd try and learn those! There is convincing evidence that being multilingual has significant benefits in other intellectual areas too, in addition to being able to actually communicate with people when you go abroad. But English speaking monoglots think that only English matters and everyone else should learn that. I speak both French and German but when I have been to these countries, whoever you speak to is far more interested in improving their English. They have no interest is speaking their own language to you. The simple fact is English is becoming the language of the world and there is no need for the average person in this country to speak another language. Why don't they sponsor more degree places? Lack of language skills is going to impinge on business, so why don't they sponsor more degree places or assist in funding secondary level education? It seems that greedy businesses want the extra profits without making any investment to achieve them. I deal with school leavers in the capacity of electrical apprenticeships. I would say that 90% of the applications that I receive, those candidates are unable to put a letter together in plain English. What hope have they in speaking/writing a foreign language when they are unable to speak/write their own language? I am a science graduate and I combined French with my degree (this involved a year in the South of France - it was hard!) One of the problems for Brits is that we don't need to learn another language, and we are not exposed to other languages. When I was in France I realised that the French are exposed to English-language music and films all the time, which obviously makes it easier and more fun to learn English. We do not have the same exposure to other languages. I am very proud of being able to speak another language, and believe I have benefited greatly from it, but I do think there are logistic reasons why as a nation we are not so good at other languages. We have always had an arrogant attitude to learning a foreign language in this country and most Brits holidaying abroad make no effort to speak other languages but expect every other country to speak English. You only have to look at the number of foreign workers working in Britain and compare that to the number of British workers working in a foreign language country to see that the House of Lords is spot on. It seems obvious to me that media distribution is the major factor in British inability to be multi-lingual. Of course people across Europe are going to be able to speak English as well as their native language when they watch English spoken films, listen to English spoken music etc. It's not an excuse, it's just the truth. Before you start teaching a second language how about teaching English first. You know, old fashioned things like spelling, grammar, how to sound an H; how to construct a sentence. Even people here in France who have been taught English can't understand the average UK tourist. As for affecting business, I don't think so, there are plenty of translators around. When I was at school I was taught French to the level where I could (and did) get by quite happily in France on holiday. However, I failed my French 'O' level because, although my grammar was perfectly understandable, it was technically very poor. Perhaps schools should teach foreign languages in such a way that the pupil's ability to communicate is what is relevant, not the correct gendering of objects. Shouldn't we get them to master English first? Of course our children should learn foreign languages but as a nation we've always been bad at learning languages and there is even less incentive when more and more people around the world have a competence in English. Certainly anyone you are likely to be doing business with overseas these days will be conversant in English so I don't see how it will hamper our trade. In Swindon a girl wishing to take A level German was told as there were only a few people wishing to take the course in would not be run- do something else. At another School you can only take German if you are good at French and Spanish is not on offer. No wonder language skills are in decline. To be an Englishman abroad can be very embarrassing. Finding someone in a foreign country who cannot speak English is rare. We must do more to ensure that children are taught a second (or even third language) at an early age - it's the only way. Whilst I feel that a second language should be taught from the beginning of primary school and remain compulsory until 16, I think the priority ought to be teaching kids how to speak English properly. The standard of both spoken and written English is fast going down the toilet and a large number of school-leavers are severely lacking in the ability to communicate in their native language, let alone a foreign one. You can see the appreciation on a foreigner's face when we Brits at least try to use their language. They make such an effort learning ours, isn't it just as useful and fair to attempt to learn theirs? GCSE foreign languages not being compulsory will enable the interested and more serious students to get on with it without the uninterested students playing up. However, I am sure that students starting early are far more likely to develop an interest in speaking a foreign language. Although it is worthy to teach children from seven years, unless they have an environment where they can practice it's not much use. Why not introduce family lessons, where a family can learn a language together and then practice at home? As long as people aren't learning German, it means I'm in demand for my language skills! Maybe if people weren't so narrow minded and lazy, they would take the time to learn a second language. Although as long as people aren't learning German, it means I'm in demand and can demand more money for my language skills! English is the next most common language in the world after Chinese. It is the international language for business, aircraft control and shipping. Please tell me what other language we should be concentrating on, considering the most common language is Chinese by populace default. Why learn French, German, Spanish, Italian or Arabic? As a Frenchman it amazes me how English people don't seem to know what tenses, nouns and adjectives are. How can you learn a foreign language when you don't even understand how your own is structured? French schools are very strict on grammar from a young age. English schools should do the same so that children have the tools to understand how words interrelate in different languages. English is almost always taught as the second language in foreign countries. It is spoken more widely than any other language so it reaps the most benefits for those that learn it. Here in Britain, and other English speaking countries, there are only limited benefits for learning another language. The BBC could set a good example if they made it a rule to present non-English speakers with subtitles rather than drowning their words with an English voiceover. It is noticeable that the Dutch and Scandinavians speak better English than the French and Germans. This is because foreign language material is shown with subtitles rather than dubbed. Learning a foreign language often includes learning about other cultures, which in turn promotes an understanding and tolerance of people from different backgrounds. In an increasingly global marketplace this is desirable and it would be short sighted of the government to limit Britain's future success. What steps should be taken to improve the UK's language skills? Simple, become part of Europe. Our children should be forced to master the English language first and foremost, then concentrate on other tongues. These days, far too many kids cannot spell or construct a meaningful sentence with correct grammar. What hope do they have if they can't even master their native language? What people don't seem to understand is that most other European countries are exposed to English on a daily basis (TV, music, film) and therefore have the opportunity to use their skills. I learnt German for three years at school and unless I wanted a job that needed German as a skill, it was totally pointless. Living in Blackpool I am not exposed to any other languages and therefore don't have the need to practice it. Having studied and lived abroad for over five years, I am completely embarrassed by the language abilities of UK students and employees compared to our European counterparts. It is about time the importance of bi-lingual and tri-lingual abilities was enforced throughout schools in the UK. Children should be taught languages from the age of seven. Foreign languages should be taught from nursery onwards. My 4 year old daughter learns French at her nursery and she soaks it up like a sponge. At her age, it's not a chore to learn - it's fun. It's high time we stopped expecting everyone else in the world to speak to us in English. I was born in the UK and have lived in several EU countries where English was not the first language. I'm now working in the Far East and can say that I have never been held back because I didn't speak another language - far from it. Thanks to the Americans, English is the business language of the world; any other view is just political correctness trying to impose itself again. When choosing my 'O' levels in 1980 I wasn't allowed to choose two languages because I had chosen two science subjects. I chose Spanish because it covers a larger population. Instead of a second language I was FORCED to study geography or history - subjects that held little interest for me then. A very good start would be to use the capacity of digital radio to broadcast Europe 1 (French), Deutsche Welle and a few other talk stations. It would be a fantastic resource for schools, and children (and adults) could listen to them in the evening too. Language skills shoot up when you have real native speakers talking to you all the time. What it is important to remember is that there are many people who work in companies throughout the length and breadth of the UK who use language every day in their jobs but never leave the country. If UK business is to continue to prosper there is a need for languages so we can communicate with our trading partners. The future business demand for linguists can only be met if languages are taught early and throughout school. Companies should offer packages for people to learn foreign languages, or offer better salaries for those who can bring in extra business by speaking another language. Schools should make pupils learn foreign languages and point out the advantages of learning. As a graduate in Spanish and Italian and a British Asian married to an Italian national, I remain dumbfounded by this nation's apathy towards learning foreign languages. For both business and pleasure, there is nothing more gratifying to a potential client or friend than being able to converse to some level in their own language. There is no better way of learning a language than spending time abroad. However, until such a time as the British public are weaned off the Costas and start embracing other cultures I fear little will be achieved. Languages should be taught from a much younger age, as in some other countries. However this is not as easy to do as it is to say because the shortage of people with language skills in this country means there is a shortage of people who can teach the languages. There may be a need to encourage language teachers to come to Britain from other countries where the language skills are better. If we can get one generation to learn languages this way then hopefully they can teach in the future. When I was a teenager in Hong Kong, I participated in a pen pal scheme organised by the United Nations International Youth Services. I had pen friends in both England and Singapore. This scheme greatly improved my English writing. With the current technology, an internet-based international pen friend scheme may help those who are keen on practising foreign languages. My Italian colleague is fluent in 4 languages (his English often puts ours to shame!). He was appalled to learn that the vast majority of British children aren't taught a foreign language until they reach their teens. Schools should be teaching languages from as early an age as possible since children are more open to new languages when they are younger. It should be compulsory for each child to study for at least one language GCSE. I hated French at the time but if I had not studied it at GCSE I would never have been able to 'get by' in France and it has spurred me on and helped learning Italian. It's such a thrill to speak a foreign language in its native country. Firstly, English is NOT the most spoken language in the world. Both Spanish and Mandarin easily beat our beloved language to that accolade. The attitude that English is an international language that everyone speaks is the problem here. If I go on holiday to Egypt, or Turkey, I just expect everyone there to speak English. Why should the rest of the world conform to the ignorance of one small country? The English language is dominant in areas of global trade and industry. I wonder about the necessity of learning other languages when the rest of the world scrambles to learn English. I predict in a few years only a few languages will remain with English being at the top of the heap. My daughter is 4, and already she knows several words in Spanish (thanks to Dora the Explorer). I think introducing languages at a very young age is the best way. Also, I'd like to see more choice at secondary schools. Let's give them one of the Chinese languages or Hindi. After all, these will be very important languages in the future. I for one am extremely lazy about learning other languages. I think it has to start young to be really effective and youngsters need a chance to actually use the languages they learn or they will quickly be forgotten. Coming from a very small country with a language only spoken by 5 million people, learning other languages is essential. But I think the biggest problem for the British is that most people around the world speak some form of English and they really don't need to learn. However, I had a colleague who's wife wouldn't serve him any food until he could say the names of it in her native language - he learned quickly! I would have preferred a wider choice of languages at school. We only had French, and I couldn't pick that up. I have enough trouble learning my own language! What do we need language skills for? Everyone speaks English these days, as a foreign language at least. Let's face it. The British are not very good at foreign languages. Key languages should be part of the school curriculum preferably from primary school onwards. The fun element of learning languages should be incorporated in the language syllabuses and staid rote learning should be avoided. There should be exchange programmes fully supported by the Education Ministries of different countries. Learning the language at the country of origin could be a vital first step. Poor language skills are not helped by the constant adoption of slang expressions on by presenters on TV shows in order to gain 'street cred'. This is one of the issues that government and 'standards agencies' should address and the only language that children need to be proficient in, is the language of this country, never mind what the government thinks. The Government should be focussing on getting every child in the UK speaking, writing and reading English before they get carried away. Get the basics right then aim higher. Dunno wot there on about. My inglish iz purfectly undastandabal. It is embarrassing when you visit European countries to find they can all speak not only their own language but English too. However, what language should be we learning? I had French forced upon me at school but never found the need to use it, whereas I could have put Spanish to use but it was never offered. The reports imply that businesses are crying out for people with good language skills. As an Oxbridge language graduate I beg to differ. I'm finding it a struggle to find jobs in which I can use my skills and earn enough to survive - without being a teacher! Perhaps the House of Lords would like to point me in the direction of these businesses that so desperately need my skills in order to compete successfully. TV broadcasting "rights" limit our access to foreign language programmes. Until foreign languages are heard and used routinely then there is no likelihood we will ever get the majority to learn. Most international businesses use English so we should concentrate on improving other skills such as maths and science. In France children are fluent in English by their late teens, and are far ahead of us when it stops being compulsory for UK students to learn French. It's incredibly arrogant to think we don't need these skills, not only do you learn a language, you learn customs and respect for the country too. If all of Europe learnt one common language, it would unite us and make holidays more fun as you could talk to anyone! Traditionally the "second language" was always French, but relatively few major countries speak French. Spanish is far more useful as it's spoken as a first language by over a billion people. Mandarin (Chinese), Arabic or Russian are also potential markets for British business and therefore valuable languages. What chance do we have teaching children second languages? We need to ensure that they can all speak English properly first. If you are talking about the use of the English language, then surely teaching the structure of it in schools would help. My partner's children brought home the work they had completed since September at Easter, and it was littered with incorrect spellings, grammatical errors and so on that had not even been highlighted as incorrect, never mind actually corrected. Given the poor mastery of our own language, how can anyone then be expected to learn, write, speak and understand any other language? I happen to think it's pretty ignorant that we as a country expect other countries to speak English, when many of us never even bother to learn the basics of another language. I definitely think languages should be made compulsory in education. Many young people from other countries can speak almost fluent English, which is really commendable and pretty lazy of us not to have bothered following in the same steps. I am a language graduate, and sadly one of an unpopular language - German. The level of German taught in schools and universities has dropped significantly in the last few years. Languages should be taught from the beginning of primary school without a doubt - specialist teachers could be brought in for this. The biggest growing language in the world is English. Wouldn't it be easier to just get everyone else to speak English and have it as a world language? I have met Dutch, Germans and Romanians whose English is better than many born here. Perhaps we should simply send our children abroad to learn English. My kids (now aged 7 and 10) had no opportunity to learn languages at their state primary apart from an After School Club in French that ran for one year and fell apart when the parent hosting it moved to live in France. Having put my kids into a private school from this year languages are regularly taught without any of the "fear factor" that creeps in with students starting later in life and progress is quick. Before worrying about learning foreign language skills, the issue of poor English language skills should be addressed starting with the regular acceptance of appalling elocution of 'youth presenters' on television. Television production companies appear terrified of using presenters who speak correctly in case that they are deemed 'posh' or untrendy and hence receive poor ratings. Children should be taught a second language from primary school age. Unfortunately this will mean that these schools will have to employ specialist language teachers, which the government is unlikely to pay for. We should introduce a system similar to the one they use in Holland within our schools. English and French are compulsory from a young age, and their language skills put us to shame. I'm ashamed to say that my knowledge of foreign languages is appalling. However, compulsory GCSEs are not the answer. I obtained GCSEs in French and German ten years ago, and I cannot remember a word of either languages. The problem we have in this country is that there is no need to learn foreign languages for average Joe Bloggs. English is of course the most internationally spoken language but that should not hold people back from learning another language. I, myself, have such pleasure in speaking to people in their native tongue and I always try and make sure that I learn a few basic words of the language of the country I visit. Perhaps the government should arrange for more exchanges amongst school children. A term at a European school when a child is, say, 14 might encourage him/her to take more interest in other languages.